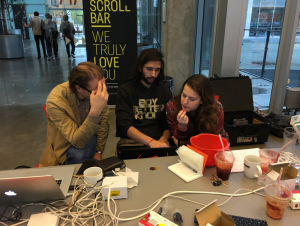 Thursday November 2nd, 2017 VIRT-EU hosted a Dowse workshop run by Jaromil and Federico Bonelli from Dyne.org at the IT University of Copenhagen. The VIRT-EU project aims to develop tools to support ethical reflection and decision making for designers and developers working with IoT technologies and services. The Dowse workshop was one of the first open-ended activities in the co-design line of work of VIRT-EU co-organized by IDA, ITU and CIID. In the workshop we were invited to explore the potential to create and reflect upon tools that make the domestic internet of things more visible to the end user. Our work allowed us to investigate how hardware and applications such as Dowse might empower and enable us to imagine other ways that our IoT systems could operate. This first co-design activity represented an informal participatory synthesis enabling participants and collaborators to align their understanding of the topic at hand through the collective creation of materials based on the Dowse technical and philosophical common ground. ‘By making visible the invisible Dowse does a bit of magic’, Federico Bonelli explains as he opens a day devoted to Dowse experimentations at the IT University of Copenhagen. Dowse is an accessible open source and open hardware device. You can setup Dowse on a low-cost computer (e.g. a Raspberry-pi) and view network activity, as well as control it, visualise it and experiment with it in multiple ways. We have created an instrument that allows you to “sense” the activity of your own network, take care of what it does, lightheartedly share your resources with your friends or neighbors and protect your home-LAN. Why would you want to sense and care for the activity of your network? 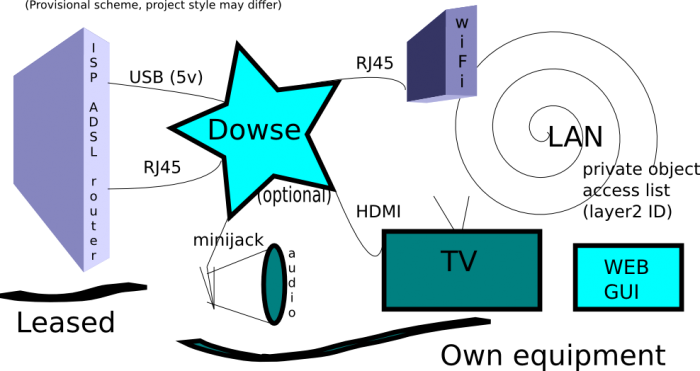 Dowse offers network awareness in ‘the age of the internet of things’ where networks host the connectivity of many different devices owned by multiple people (Dowse Whitepaper Version 1.2 2017). By allowing you to sense the activity of your network Dowse attends to some of the challenges related to IoT such as invisibility and lack of transparency. Such concerns are also expressed in a multiplicity of IoT manifestos written and published in recent years in Europe, such as the IoT Design Manifesto. In this sense, the Dowse workshop was a network sensing workshop where the invisible was made visible, expanding our awareness of how IoT devices work and making the threats these may represent clearer in terms of what happens as they become integrated into daily life. Because Dowse allows you to see what kind of events are happening on your network in real-time that may otherwise be invisible, it is also called ‘the awareness box’. This is why the workshop started out with exercises for awareness to open up our senses. We were all asked to stand up and gather in a circle, first presenting ourselves in pairs and then presenting our partner in the collective circle. We walked around the room and noticed what was present in our physical location (tables, chairs, lamps, cables, cameras, people, raspberry-pi’s and more). After this visual exercise we closed our eyes and walked around again in pairs, led by a stranger we rapidly tried to trust, while listening to the sounds in the room. Now, you may wonder what all of these exercises have to do with a workshop aimed at experimenting with Dowse. While all participants were standing in a circle Jaromil explained how awareness is more important than security because ‘it makes us aware of what we care about’. This point is part of a transition from the exercises to the experimentation with Dowse. We are all told that we will connect to things as we just connected to each other. To manage your device’s behavior you must be aware of what they do, and after the community building exercises we got to learn more about Dowse and a chance to build an awareness system of our own. Dowse itself is a tool – and, evocative of its name, it can be used to discover the unseen or unknown. The question we started to consider as we worked with the aspects that can become “seen” through Dowse was: what do we want to call attention to? What should we communicate to an audience (and to ourselves) about what is happening underneath the layers of glassy interfaces that we touch everyday? The risk of unconscious abuse and exploitation of information is growing tremendously. As ‘things’ initiate connections on the behalf of users, we are making a major leap towards a world that provides us with contexts that we may not want at all. Therefore being aware of events taking place on the local network is very important. In 2 hours, we connected to the Dowse machine (a raspberry Pi) using the software interface on node-red. We partnered up, explored the data, and created two projects that experimented with the network traffic data. One project opened every single webpage that the devices in the room were trafficking over only 1 time. Thus it visualised the least common and least visible elements of our network browsing patterns. What other parts of the web do we touch in the background of our purposeful browsing? Another project read out loud the name of the server for each web-page that the devices in the room accessed – and combined that with music (also controlled by which server was being used) to create an orchestra of network traffic. A project aimed to highlight and foster potential interactions among people connected on the same LAN switching on and off a light (Philips hue) everytime two people were connecting to the same website at the same time. You can see these projects in the video of the workshop. VIRT-EU explores how ethics is enacted among European designers and developers of IoT technologies. 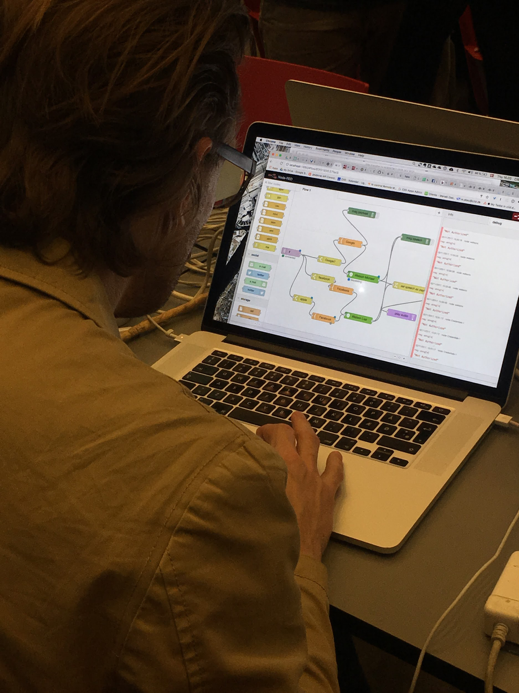 As it also became clear during the Dowse workshop, IoT developers are faced with multiple ethical challenges as they design future connective devices. Jaromil and Federico describe how one might design for a situation with many unknowns when involved in IoT. These many unknowns are not least due to the relative immaturity of IoT– where future possibilities and disasters will continue to manifest as new developments play out. VIRT-EU consortium members Irina Shklovski (ITU), Ester Fritsch (ITU), Obaida Hanteer (ITU), Annelie Berner (CIID), Raffaella Rovida (CIID) and Monica Seyfried (CIID) attended the workshop along with about ten participants arriving from a range of backgrounds and engagements.